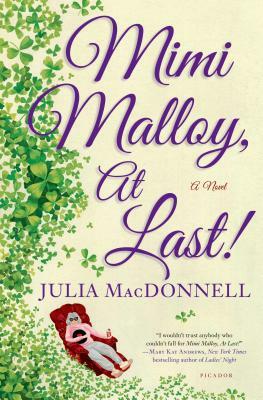 Meet Mimi Malloy: A daughter of the Great Depression, Mimi was born into an Irish-Catholic brood of seven, and she has done her best to raise six beautiful daughters of her own. Now they're grown, and Mimi, a divorcee, is unexpectedly retired. But she takes solace in the comforts of her new life: her apartment in the heart of Quincy, the occasional True Blue cigarette, and evenings with Frank Sinatra on the stereo and a highball in her hand. Yet her phone is arguably the busiest in greater Boston it rings "Day In, Day Out," as Ol' Blue Eyes would say. Her surviving sisters love to gab about their girlhood, while her eldest daughter, Cassandra, calls every morning to preach the gospel of assisted living. And when an MRI reveals that Mimi's brain is filled with black spots areas of atrophy, her doctor says it looks like she's destined to spend her days in "one of those storage facilities for unwanted antiques." Mimi knows her mind is (more or less) as sharp as ever, and she won't go down without a fight. Yet as she prepares to take her stand, she stumbles upon an old pendant of her mother's and, slowly, her memory starts to return specifically, recollections of a shocking and painful childhood, including her sister who was sent away to Ireland and the wicked stepmother she swore to forget. Out of the ashes of Mimi's deeply troubled history, Julia MacDonnell gives us a redemptive story of the family bonds that break us and remake us. "Mimi Malloy, At Last " is an unforgettable novel, alive with humor, unexpected romance, and the magic of hard-earned insight: a poignant reminder that it's never too late to fall in love and that one can always come of age a second time. Julia MacDonnell's fiction has been published in many literary magazines, and her story "Soy Paco" was nominated for a Pushcart Prize. Her journalism has appeared in The Boston Globe, the New York Daily News, and the Columbia Journalism Review, among other publications. A tenured professor at Rowan University, she is the nonfiction editor of Philadelphia Stories. Mimi Malloy, At Last! is her first novel in twenty years.